BUT YOUR PET MIGHT NOT. Happy Birthday, America! Amidst all the fun and good times, it is easy to forget about our pets’ safety and well-being. Noisy celebrations, especially fireworks, can frighten our pets and put them at risk. So keep in mind these simple pet safety tips to be sure this holiday is a memorable one for all the right reasons. Make sure your dog or cat always has access to a comfortable, quiet and safe place to hide. Either a close, under a piece of furniture or in his crate. Keep toys in your pet’s safe area to make the area more fun and to provide distractions from loud noises and flashes. 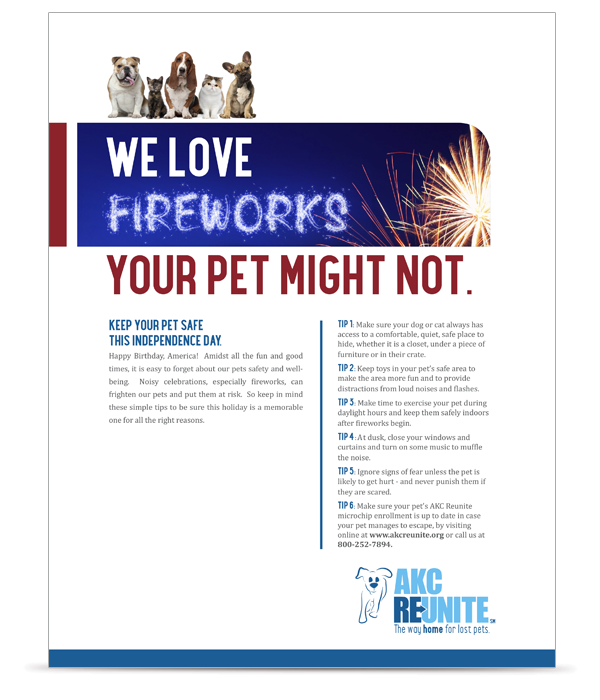 Make time to exercise your pet during daylight hours and keep them safely indoors after fireworks begin. At dusk, close your windows and curtains and turn on music to muffle the noise. Ignore signs of fear unless the pet is likely to get hurt – and never punish them if they are scared. Make sure your pet’s AKC Reunite microchip enrollment is up to date in case your pet manages to escape. You can update your records online or call us at 800-252-7894.